On the Husic’s hillside property, overlooking the Stags Leap District of Napa Valley, Julie and Frank set out to realize a life-long dream. In 1997, moving endless rocks and sculpting narrow terraces that cling to the mountain’s edge, they planted three small, extremely steep Cabernet Sauvignon vineyards, which peacefully coexist with the region’s wildlife. The rugged, rocky growing conditions, combined with careful farming methods, have yielded a limited amount of magnificent fruit. Now on their 15th release, offering two Cabernets – Husic Vineyards and Palm Terrace, both wines come from the three estate vineyards. In addition, two wines from Sonoma Coast: Husic Vineyards Chardonnay, and Husic Vineyards Pinot Noir. They also offer a limited amount of a lovely Palm Terrace Rosé of Pinot Noir and an exquisite Husic Vineyards Late Harvest Semillon. The Husic family is proud to share these beautiful wines with you. 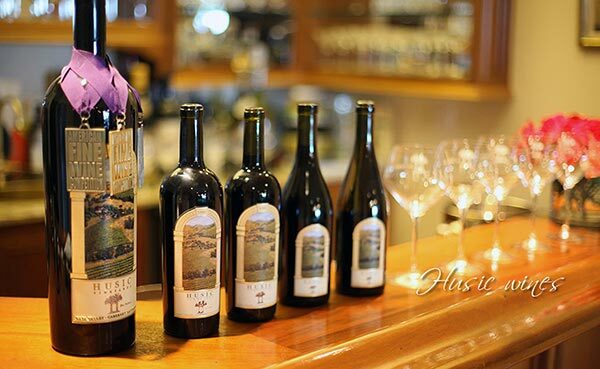 Club Members receive three bottles of Husic wines twice a year and receive a 20% discount on all purchases. In addition, our Magnum sales are exclusive to Wine Club Members.